Christians will soon begin to prepare for the Christmas celebrations. In the church, this time of preparation is called Advent. This year Advent begins on the 27th November. Traditionally during this time we use an Advent wreath containing five candles. One candle is lit each Sunday over the following weeks. Each candle represents an aspect of the spiritual preparation for the coming of the Lord, Jesus Christ. Four candles are set around the outer ring of the wreath; three purple and one pink candle. A white candle is placed in the centre of the wreath. As a whole, these candles represent the coming of the light of Christ into the world. First candle - The Prophecy Candle or Candle of Hope. On the first Sunday of Advent, the first purple candle is lit. This candle is typically called the "Prophecy Candle" in remembrance of the prophets, primarily Isaiah, who foretold the birth of Christ. This candle represents hope or expectation in anticipation of the coming Messiah, Jesus. On the second Sunday of Advent, the second purple candle is lit as a reminder that Jesus was born in Bethlehem. The colour purple represented royalty and in this context is a reminder that Jesus is seen by many as being a King. The focus for this week is often on John the Baptist as he called us to repentance to prepare for the coming of the Messiah; the Light sent into the world to show us the way out of darkness and sin. On the third Sunday of Advent the pink candle is lit. This is customarily called the "Shepherds’ Candle" and it represents joy. The shepherds, some of the first people to see the Christ-child, were amazed and rejoiced at what they saw. Christians believe that the only lasting joy to be found in this life on earth is through Christ. All other joy is considered to be fleeting. 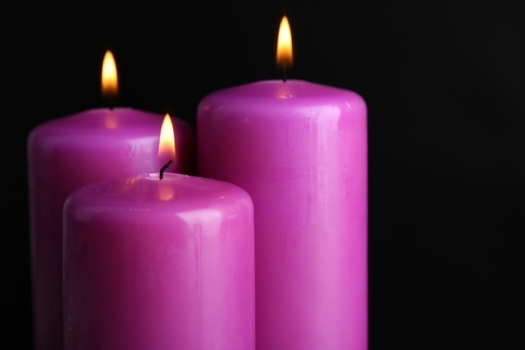 The fourth and last purple candle, often called the "Angels’ Candle," represents peace. It reminds that Jesus comes to bring peace to both the world and to people’s hearts. The Christian belief is that without Christ, there can be no real peace in this world. The fifth candle represents Christ himself who was born to save people from their sins. It is a celebration of the fulfillment of the prophecies pointing to Christ’s birth, and to the hope in the final fulfillment when Christ will come again. This candle is lit on Christmas Eve or Christmas morning as we celebrate the coming of the light into the world. As we begin our preparations for Christmas, may we reflect on what these candles represent and find the love, joy, and the hope that is found in the Christ-mas child, Jesus.